SALE! For a limited time, buy PowerDesk online. Only $19.95 (Reg. 29.95) plus $7.95 S&H per unit*! If you are a professional who spends time on the road, you know how much "down" time is wasted each day. Meetings are often canceled, pushed back or aren't as long as anticipated. With PowerDesk, you can now take advantage of that idle time to get ahead of your paperwork and your competition, enter meeting notes or work on your next plan of action. All in ergonomic comfort from the convenience of your parked vehicle! PowerDesk Turns "Down" Time Into Productive Time! PowerDesk is a productivity tool especially valuable for portable computer users, and is also useful for ordinary paperwork. Sales and service personnel, realtors, insurance investigators and adjusters, field engineers, highway crew, social workers, home-health care providers, utility and law enforcement personnel are just some of the professionals who are benefiting from this portable work desk. Quick and Secure Universal Fit: Anchors instantly to any steering wheel. Provides sturdy desk support for all portable computers. Great also for ordinary paperwork. No installation needed! Ergonomic Design: Work in comfortable neutral position with the computer screen at eye-level, protected from sun glare. No more sideways twisting, neck bending, or eye squinting! No more backaches or headaches!! Personalized Comfort: CustomTilt feature enables the user to easily adjust the desk angle to suit personal preference and vehicle. Durable: Made of super-strong polymer. An attractive finely textured granite finish resists scuffing. 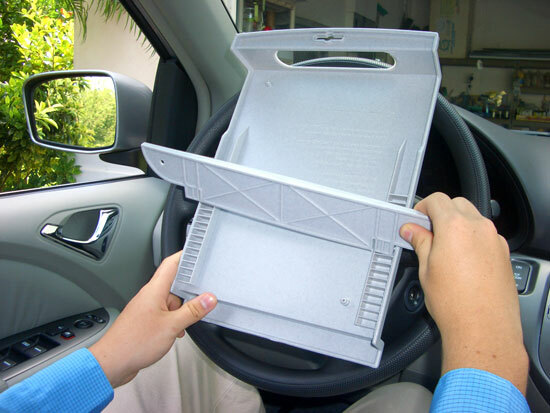 Compact: Easy storage under seat, or in notebook carrying case. Nests against laptop for portability. Versatile: Use anywhere as a sturdy desk for portable computers and accessories, or for ordinary paperwork. Whether you're sitting in a chair or working at a desk, PowerDesk provides an ergonomic, gently sloping platform upon which to rest your portable computer for optimum comfort and efficiency. PowerDesk keeps the burning heat from today's fast CPUs away from your lap, and also allows the CPU to run cooler! Safe: Designed with safety in mind, PowerDesk disengages with turning of the steering wheel. 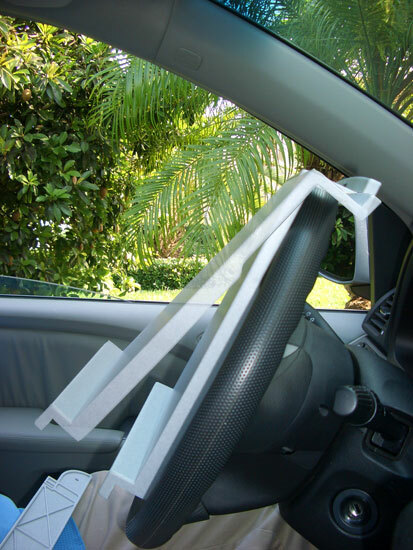 Use whenever your vehicle is safely parked and the ignition is turned off. PowerDesk pays for itself — many times over — in increased productivity! A useful item for employees, friends and yourself. 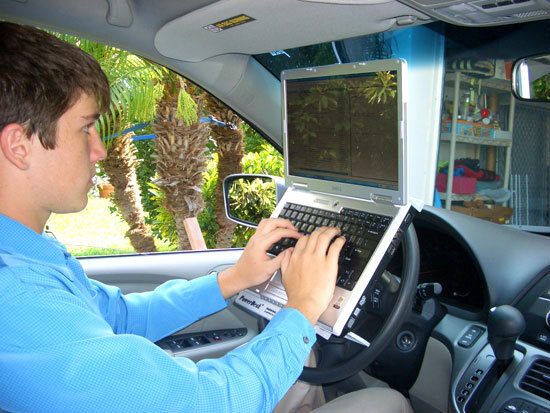 Use your laptop in the car without hassle! CustomTilt allows the angle of the PowerDesk to be adjusted easily. PowerDesk can be used with or without the angle adjuster. "...Everyone on our 50-member team is excited to have relief from their neck strain thanks to your product!" "...Whether it is waiting in the car for children after athletic practices, skipping lunch to meet a deadline while on the road, or making last minute configuration or proposal changes in the parking lot of a client, this product meets the challenge of balancing the notebook computer so real work can be accomplished. I wholeheartedly endorse its use and find it to be of tremendous benefit frequently..."
"...For years, I've put up with back pain, headaches, poor lighting, and low productivity as I worked on my laptop in my car. The PowerDesk has changed all that! The work I normally put off, I now do in my car. The PowerDesk positions the laptop at a comfort level equal to my home office, increasing my productivity 200-300%. What a difference! It is truly an amazing product; so simple, and yet so effective..."
"...In my opinion, if you are using a laptop computer in a car you should be using PowerDesk. Your product is a great solution to annoying problems that impact our field reps' productivity..."
-- John Del Pizzo, Project Leader, Information Systems, Rhone-Poulenc Rorer Pharmaceuticals, Inc.
"... I have had numerous positive comments from the field officers who are using your product..."
"... PowerDesk has come in very handy. I supervise a group of police detectives whose primary responsibility involves field surveillance work. This leaves me little office time to complete my administrative duties. However, with PowerDesk, I am now able to utilize my laptop to complete reports and meet paperwork requirements while in the field..."
"... PowerDesk certainly has made me more productive when I'm on the road. I also find it useful in holding my planner while I make phone calls from my car. It's like having a portable podium. I also appreciate its quality and design. Thanks for a great product!..."